Virtuoso saxophonist, David Salleras, will perform several concerts in KwaZulu-Natal with Pietermaritzburg concert pianist, Christopher Duigan, as part of a nationwide tour in June and July. - Casa Mexicana, 35 Montgomery Drive, Athlone, Pietermaritzburg, on June 24 at 19h30. Tickets R160 including refreshments. Booking is essential. Email booking@musicrevival.co.za or send an SMS or WhatsApp to 083 417 4473. Safe parking is available. - St Agnes Church in Kloof on June 29 at 19h30. Tickets are R130, which includes refreshments. Book tickets by calling the St Agnes Church office at 031 764 2037. Secure parking is available. Since his first visit in October 2012, Salleras has been collaborating on a project of concerts and has recorded two albums with Duigan – Indigo and Midnight Blue – both of which are available on iTunes. The Barcelona-based musician has attracted international attention through his fluency in a variety of musical styles. His innovative compositions, which incorporate traditional flamenco idioms with contemporary and avant-garde performing techniques, are performed by saxophonists worldwide. Duigan, meanwhile, is widely regarded as one of South Africa's leading concert pianists. He has performed extensively with the KwaZulu-Natal Philharmonic, Cape Philharmonic and Johannesburg Philharmonic Orchestras and has a popular following through his innovative Music Revival concerts. For this series, the two musicians will perform works from the traditional saxophone repertoire by Jules Demersseman, JS Bach, Darius Milahaud’s Scaramouche and music from Spanish composer/saxophonist by Pedro Itturalde. Itturalde's Suite Hellenique traditionally offers pianist and saxophonist plenty of opportunity to explore a wide range of dynamic interplay through a variety of musical styles. 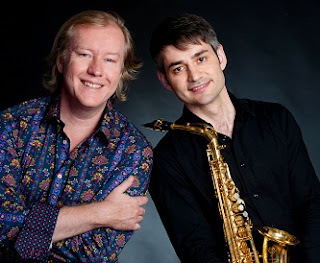 Also on the programme will be Salleras and Duigan’s own creative arrangements of music by Astor Piazzolla, Salleras’ own solo work, Caprices, and Duigan's compositions from Indigo and Midnight Blue. Copies of Indigo and Midnight Blue will be available to purchase at all concerts.